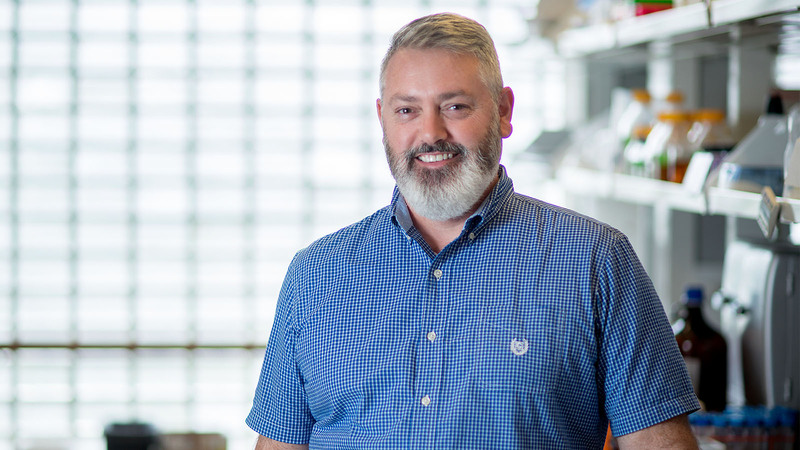 Todd Lowther, PhD, develops therapeutic agents to prevent and treat disease, with a primary focus on hyperoxaluria and kidney stone formation. Through industry partnerships, he advances drug development and design for various diseases, including hyperoxaluria, prostate cancer and mesothelioma. Lowther earned his doctoral degree in biochemistry and molecular biology from the University of Florida. He studied aspartyl proteases and their inhibitors and then protein crystallography and redox biology processes during his postdoctoral studies at the University of Oregon. In 2002, he joined Wake Forest School of Medicine’s department of biochemistry to further focus his research on redox biology and the mechanisms of oxidative stress enzymes. In his research, Lowther uses structural biology, biochemical and X-ray crystallographic techniques to study proteins involved in redox biology and the metabolism of hydroxyproline, glyoxylate and fatty acids. His primary focus is to develop inhibitors for the prevention and treatment of oxalate kidney stone disease and primary hyperoxaluria in children and teenagers. Lowther develops therapeutic agents that block hydroxyproline and glyoxylate metabolism, key metabolic pathways that can lead to oxalate formation. Through collaborations with the University of Alabama at Birmingham and the Mayo Clinic, he advances these studies into animal models and clinical trials with the goal of developing therapies for the personalized treatment of recurring kidney stone disease. In addition to his work in kidney stone disease, Lowther also studies redox biology and the development of novel agents for the treatment of mesothelioma and cancer. He analyzes the molecular basis of peroxiredoxin function, exploring their crystal structure, mechanisms and drug-protein complexes to develop next-generation drug therapeutics for disease. He is also involved in the development of fatty acid synthase inhibitors for prostate cancer therapy. Identifying new therapeutic approaches for disease drives Lowther’s efforts. He serves as deputy chair of the Oxalosis and Hyperoxaluria Foundation Scientific Advisory Board. He also has experience collaborating with industry to advance structural biology and chemistry efforts, specifically for proteins and enzymes involved in redox biology and the metabolism of glyoxylate, hydroxyproline and fatty acids.